Imagine a football stadium which is filled with water. Every minute one drop is added. The number of drops doubles every minute. Thus it goes from 1 to 2, 4, 8 16 etc. So how long would it take to fill the entire stadium? One day, one month or a year? No it would be a lot quicker and only take 50 minutes! That in itself is hard to understand but even more interestingly, how full is the stadium after 45 minutes? Most people would guess 75-90%. Totally wrong. After 45 minutes the stadium is only 7% full! In the final 5 minutes the stadium goes from 7% full to 100% full. Depending on the magnitude of the problem, including the geographical spread, it is very difficult to prepare for it for normal people. Very few have their private jet and residences in many parts of the world. However, for people who have savings, now is the time to take defensive measures if you haven’t already. I know of very old family wealth who for hundreds of years have kept their wealth in property, art and gold with 1/3 in each. With productive land, this has of course been a superb portfolio and will continue to do very well during the coming downturn. Gold and agricultural land are real wealth preservations assets whilst some art today is a bubble asset and therefore will suffer. But 2/3 of the assets in this family’s portfolio are likely to perform extremely well in coming years. As the superb Chairman of Sprott USA, Rick Rule, stated at the New Orleans Investment Conference last week: “Either you are a contrarian, or you will be a victim”. The reality is that most people will be victims in coming years. Very few will realise that what we will see next is the end of a major era or cycle of a major degree. Whether it is a 300 year cycle or a 2,000 year cycle doesn’t really matter. Historians will know afterwards. What we need to focus on today is to protect ourselves against these risks rather than to become victims. Also, Greenspan’s easy money policy had started in 1987 when Fed Funds reached 10%. With a weak economy, and weak asset markets Greenspan started his stimulative policy and lowered rates down to 3% in 1992. 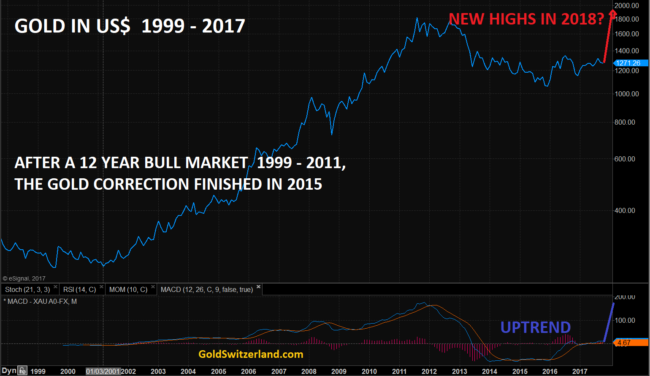 They had gone under 2% in early 2002 when we bought gold. Eventually rates came down to 1% on Greenspan’s watch. When Bernanke then needed to sort out the mess during the great financial crisis, rates were lowered from 5% in 2007 to 0% in 2009 where they stayed until 2015. 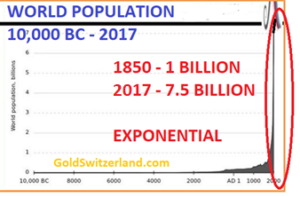 We are now at the point when the world will be punished for 35 years of excesses which is the culmination of the 100 year experiment of Fiat money started by the Fed in 1913. The $2.5 quadrillion bubble of debt and liabilities (including derivatives and unfunded liabilities) is 35x greater than global GDP and can of course never be repaid. The 2006-9 crisis was a serious rehearsal of what is still to come. 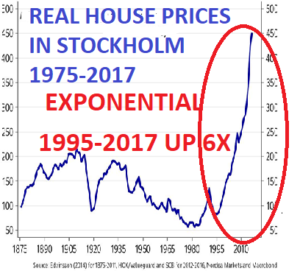 Governments and central banks managed to deal with the inevitable collapse for a few years by a massive stimulative package. From having added $2 trillion a year, the proposed tapering will by 2019 mean that all of this added liquidity will be withdrawn and eventually turn negative. In addition, central banks are planning to increase interest rates as inflation is starting to rise. 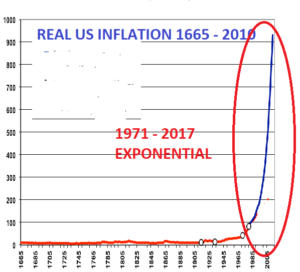 Anyone who has the slightest knowledge of markets knows that it is the trillions of dollars of credit expansion and money printing that has created the biggest asset bubbles in history and especially inflated stock markets. To stop feeding an addicted world with debt, will not only kill stock markets but also all the other bubble markets. Addicts don’t just stop feeling good when they no longer receive their daily injection. No, they start feeling absolutely awful and go into a crisis that they seldom recover from. It is the same with the world economy. It is today totally dependent on continuous injections of credit and liquidity. Taking $2 trillion of liquidity away from a liquidity needy world will make it permanently sick. The effect will be collapsing stock, property and credit markets leading to panic in the financial system. That will lead to the biggest Volte Face ever in global monetary history in the next 6-18 months. 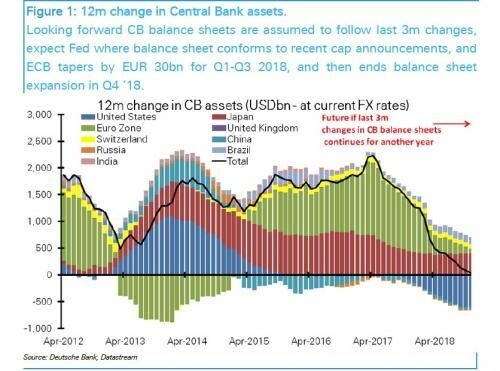 Central banks will panic and start printing more money than ever before. 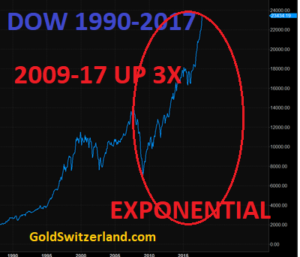 First in the tens of trillions of dollars leading on to hundreds of trillions and eventually quadrillions of dollars as the derivative bubble blows up. The initial printing might have some short term beneficial effect on markets. But soon the world will realise that worthless pieces of paper or zeros on a computer can never create wealth or save the world whatever the Keynesians or Krugman says. Eventually this will lead the world to hyperinflation followed by a deflationary implosion. But the course of events will not be straight forward in this process because we will have a combination of hyperinflation and deflation simultaneously. The value real assets including many commodities like precious metals, food and agricultural land will increase in value. Money will of course hyperinflate as it is printed in unlimited quantities whilst stocks, bonds and property will collapse in real times. From a wealth preservation point of view, precious metals are our favourite. When buying stocks, an investor is exposed to the financial system, the survival of which is doubtful. The only way to avoid that is thorough direct registration which is difficult for most investors. Also, direct ownership of agricultural land is not practical for everyone. And if it is bought via a fund, it entails exposure to the financial system. Thus, in our view, the biggest exposure should be in physical gold and silver with a smaller allocation to the other areas above. Anyone who is not prepared to take a contrarian view today, risks to be a real victim in the next 5-7 years.